BEIRUT – Fighting escalated in southern Syria as government forces on Tuesday pushed deeper into rebel-held territories in Daraa province in a weeklong offensive that the United Nations estimates has displaced up to 50,000 people. Daraa’s residents described living in extreme fear and said many had also headed to the frontier with the Israeli-occupied Golan Heights, believing it to be safer. The escalation in Daraa, near Jordan and the Israeli-occupied Golan Heights, came as Syria’s state media reported that two Israeli missiles struck an area near the Damascus International Airport early Tuesday, without naming a specific target. Since last Tuesday, Syrian troops have targeted rebel-held areas in eastern Daraa, one of the country’s last major rebel strongholds. The strategic area was part of a truce deal reached last July between the United States, Russia and Jordan. The offensive’s goal appears to be regaining control of the border crossing with Jordan, which has been in rebel hands since 2015. President Bashar Assad’s recent military victories, including the capture of Damascus suburbs and southern neighborhoods, have propelled the push. Opposition activists said Syrian and Russian warplanes are taking part in the offensive. Russia’s air force threw its weight behind Assad’s forces in 2015, turning the tide of the war in his favor. Daraa-based opposition activist Osama Hourani denied the government controls parts of al-Lujat, saying the area, known for its caves and rocky plains, will be a challenge for Assad’s troops. “The safest place is the border with Israel because the regime and Russian airplanes cannot strike the area,” he said. “No one stayed,” Shtawi said. Israel has also carried out a series of strikes recently on Syrian and Iranian forces in the area, warning against the expansion of Iran’s role in Syria. Iranian advisers and Iran-backed militias are embedded with Syrian troops. “We’re sleeping in the open air, under the trees, in the mosques and schools. Those lucky to find a tent have to share it with four or five other families,” the WFP statement quoted a displaced man named Nidal. Jordan’s Foreign Minister Ayman Safadi urged the U.N. to provide security in southern Syria. “Our borders will remain closed,” Safadi wrote on his Twitter account. 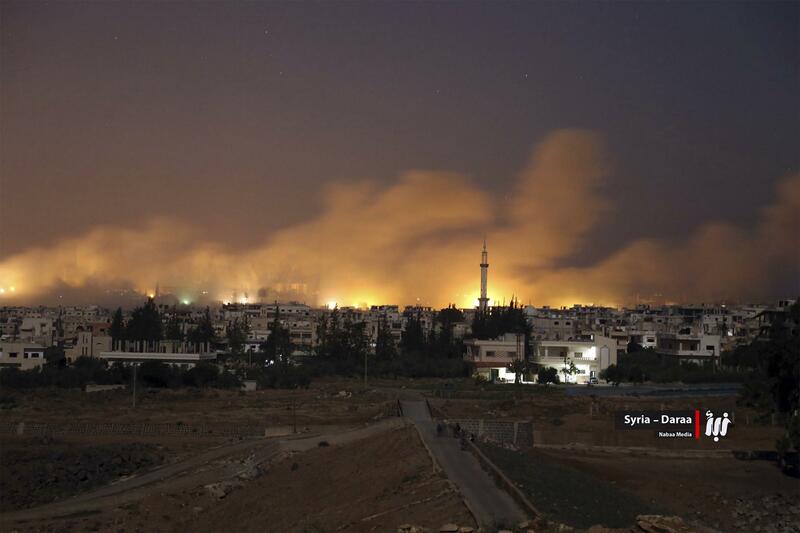 Tuesday’s attack near the Damascus airport was the latest blamed on Israel. Such strikes have increased in frequency amid soaring tensions between Israel and Iran, a major Assad ally. SANA linked the strike to the Daraa offensive, saying it comes amid “major losses” for the rebels and repeating the government’s claims that Israel supports “terrorists” operating within Syria. Published: June 26, 2018, 11 a.m.